Welcome to another game review. 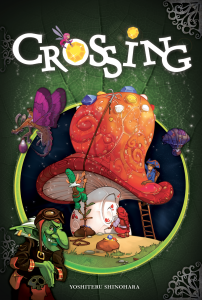 Crossing is a great little game that is filled with silly moments and tons of laughs. I have played it with my five year old daughter as well as adults and everyone agrees that this is a great filler game. One of the cool things about this game is that anyone can learn it in about 2 minutes... I mean really, this VLOG review is only 3 1/2 minutes long and that includes some other things as well. While the video takes you through the game, it doesn't show you the fun and silliness that abounds when you play it with several other players. This is a must buy for anyone that teaches kids. It is a great fun game to have in your classroom or on a family road trip. After you're done watching this video take some time to watch this review as well as others to find some great games for your class and your family. You can pick up a copy of this game at Amazon!